Our business has been established over 40 years and we have all this experience to share with you. We supply bras, girdles, corselettes and underskirts. All underwear is supplied in ladies, mens and chilrens sizes. Hosiery in ladies, men’s, and children’s sizes. We also stock a large range of tights and stockings. We also sell suspender belts in a range of colours & sizes. 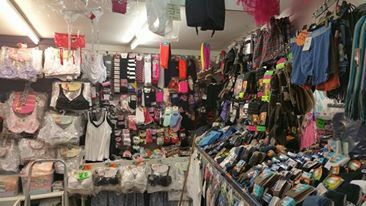 We also stock a range of slipper socks, leg warmers & fashion socks, over knee socks and men’s bigfoot socks in size 11-14. We have a selection of seasonal accessories including hat, scarves & gloves in various colours and sizes. Our nightwear includes pyjamas, nighties, chemise, bed jackets (poly cotton & silk) and dressing gowns. We also stock overalls and tabards. Our opening times are Monday – Saturday 9am – 4.30pm.